Noteworthy is, not a matter of the look of the cake itself, but rather a sense that it generates must be in accordance with our tongue to taste it, and therefore to make this cake we need to prepare the necessary materials and also equipment that will be supporting the success of the making of this cake. Well, that is not too long in reading this article, you'll want to prepare in advance the necessary ingredients. For this chocolate cupcake recipe does not require materials and also equipment that are difficult to find, we just need a muffin tin and place steaming. - 100 grams of sugar. - 100 grams of margarine is melted. - 75 grams of dark cooking chocolate is melted. - 75 grams of wheat flour. - ½ tsp cake emulsifier. - ½ tsp baking powder. - 12 tablespoons of milk powder. o Beat eggs and sugar together with cake emulsifier until white and fluffy. o Then add flour, baking powder and milk powder, while in the sieve and stir evenly. o After that, enter the margarine and chocolate also sebelunya has melted and stir evenly. o Then pour the batter into muffin tins that have been lined with paper cups until ¾ full. o Once completed, kukuslah mold the mixture for approximately 20 minutes / mature. o Once cooked, remove from heat and let cool. Cupcake ready to be served. Chocolate cupcake cake was fitted eaten at night or you're relaxing with a cup of tea or cappuccino. For the chocolate cupcake recipe flavored, you can try it yourself at home with added flavors to suit your taste. 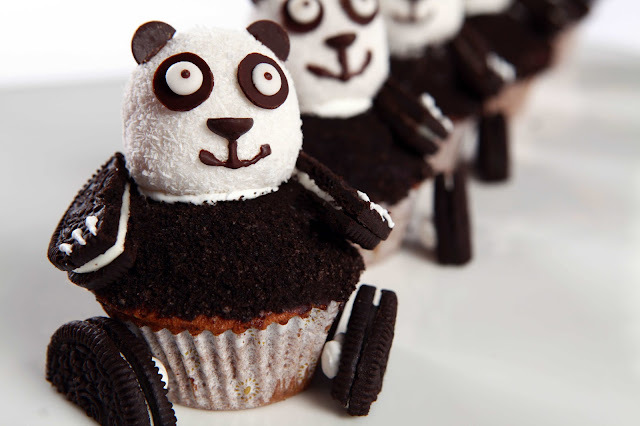 0 Response to "CARA MEMBUAT CUPCAKE PANDA YANG ENAK DAN LUCU"